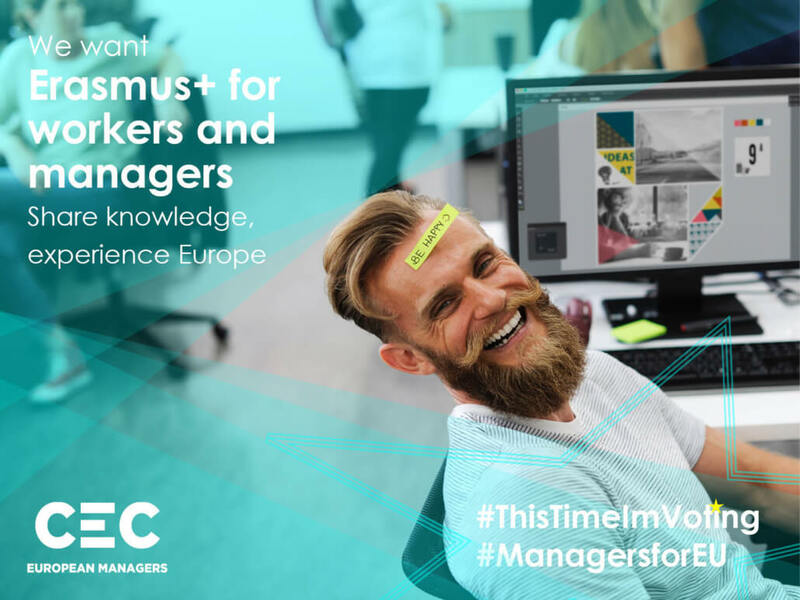 Ahead of the European elections on 23-26 May, CEC European Managers calls upon managers and professionals in the EU to make use of their voting right and put managerial issues at the heart of the political agenda. More than ever, the unique political project has to be protected and made fit for future challenges. 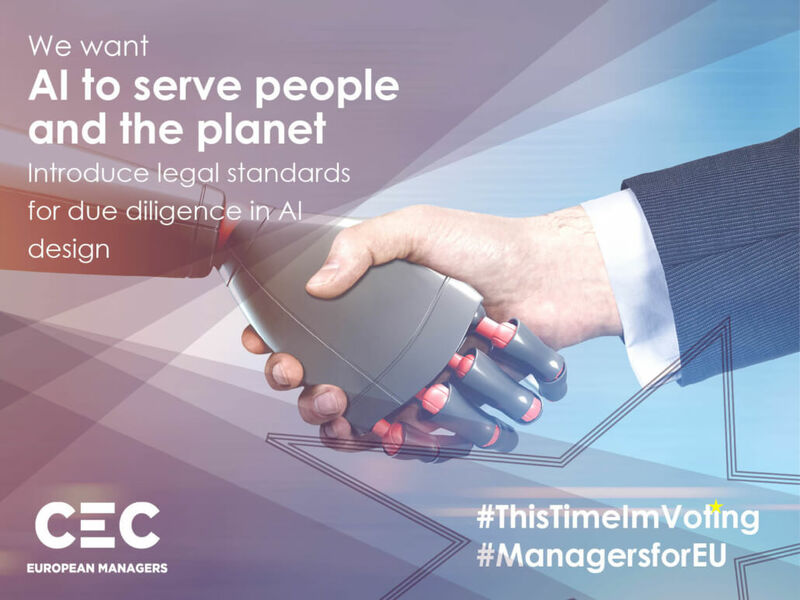 As the voice of European managers at EU-level, CEC highlights the need for an updated European Parliament resolution on managerial prerogatives. Sustainable leadership, lifelong learning and gender equality count among the cornerstones of an evolving profession. Concretely, CEC underlines the need to improve labour mobility and learning opportunities by opening up Erasmus+ to workers and managers. Furthermore, rights to vocational education and training in member states should be portable to facilitate the recognition of continuous education in the Union. At last, human responsibility should remain at the centre for the development of Artificial Intelligence. Technology development has to go hand in hand with a positive social impact and competent management for it to succeed. Please find CEC’s electoral demands as a photo gallery and in text version below (download the PDF here). The European Union stands before unprecedented challenges. Within a tense international context and attacked by forces questioning the legitimacy of the European project, supporters of the world’s largest democracy throughout the continent have to stand up, defend and strengthen this unique model. 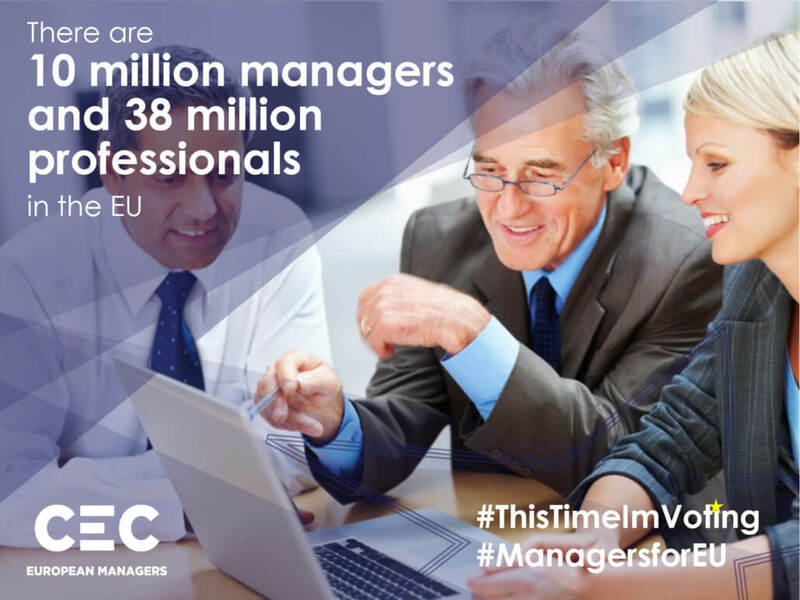 Many of the 10 million managers and 38 million professionals in the EU are an active part of society and shape a more sustainable, inclusive and prosperous future. 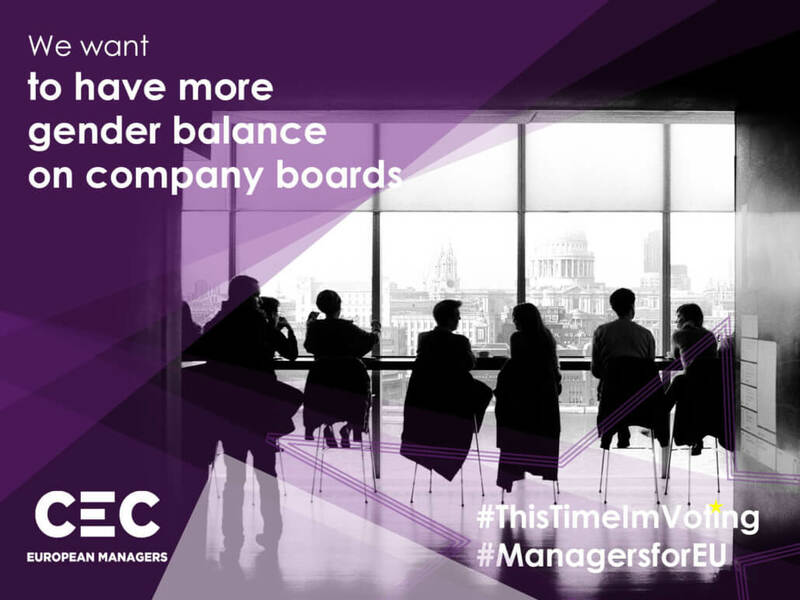 With this paper, CEC European Managers gives a voice to these men and women. In the first part, we identify a set of global issues and explain the EU-added value. 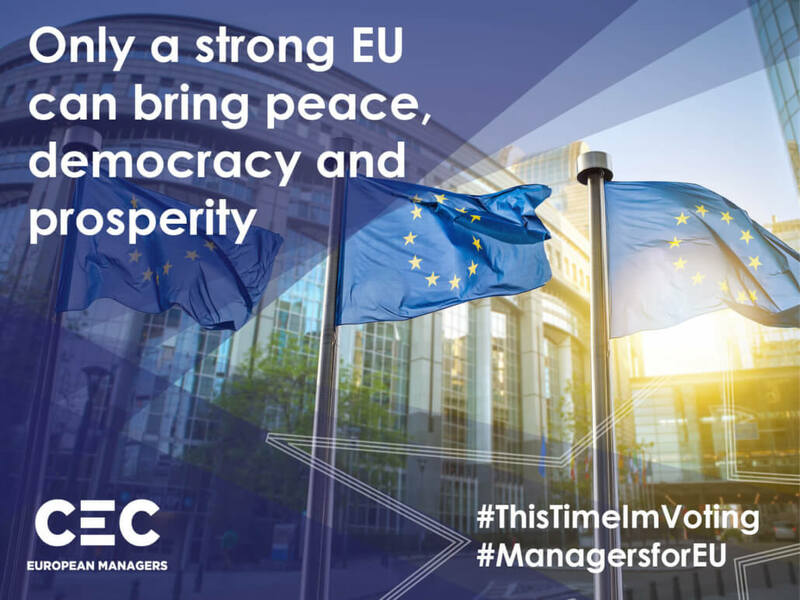 In the second part, we voice our managerial demands for the EU after the elections in 2019. We call upon voters to consider the EU added value in a number of domains in their electoral choices and highlight key policy priorities for the EU in the coming legislative period. In a global context where economic competition, geopolitical tensions and environmental threats are scaling up, no European country can realistically expect to be able to weather the storm by itself. Uniting in a common, equally participated institutional framework like the European Union is the only antidote to global irrelevance. This includes the management of migration, in a way that combines economic considerations with humanitarian obligations. Aware of the damages of protectionism, managers know how fair international trade relations and competition rules can be beneficial to the world economy. Once again, only a strong EU can defend the trade interests of the single market while adopting a multilateral approach to international relations in which world commercial flows can thrive. In many ways, the European social model has been more resilient than others in the world. Welfare state achievements have been historical cornerstones of most EU member states, However, a shrinking middle class, digitalisation, an ageing workforce and globalisation make it necessary to update the model. Only a courageous EU can help to make this happen, in close partnership with EU member states and respecting the principle of subsidiarity. You can read more about our vision for the future of the European social model in our paper “The social dimension of Europe”, available here. Decreasing biodiversity, global warming and the depletion of natural resources are putting nature’s resilience under pressure, threatening life on the planet. We now have to seize the opportunity to transition towards a sustainable socio-economic model. 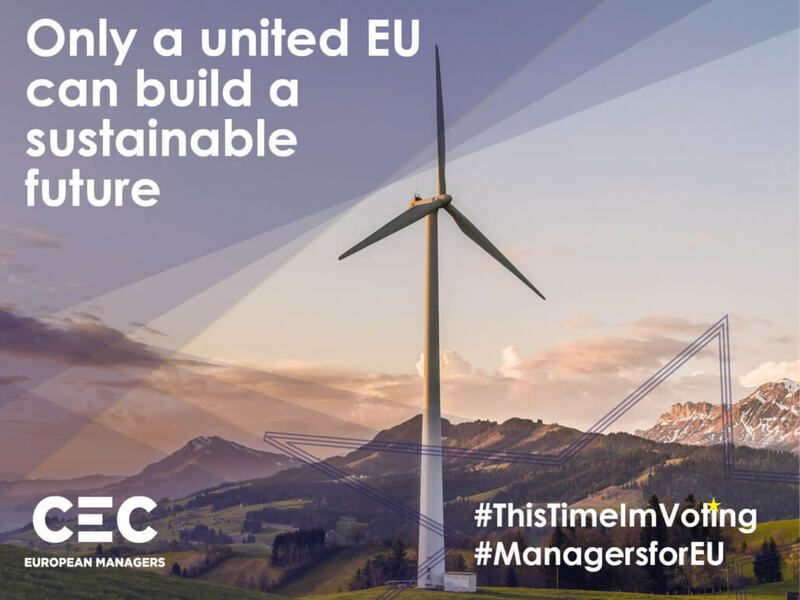 Only a united EU can lead by example engaging in actions that can represent a model for other global players (like delivering on the climate targets set in the Paris Agreement). 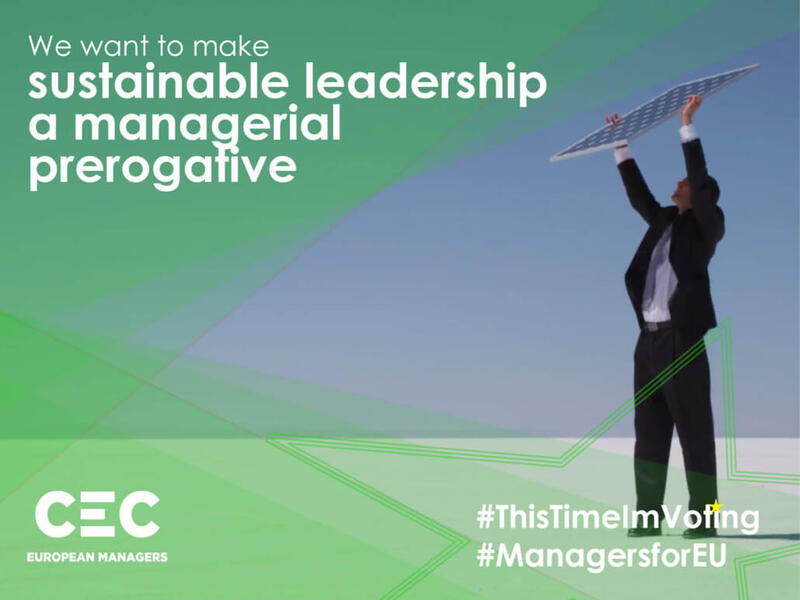 At their level, managers have a lot to do to ensure that their managerial and leadership styles are in line with new sustainable models. To read more about how we think leadership and sustainability can go together, you can find our “Sustainable Leadership Guidelines” here. Managers are change-leaders and bridge-builders between employees and employers, whose role will be to increasingly work on making the transition towards a more sustainable socio-economic system happen. 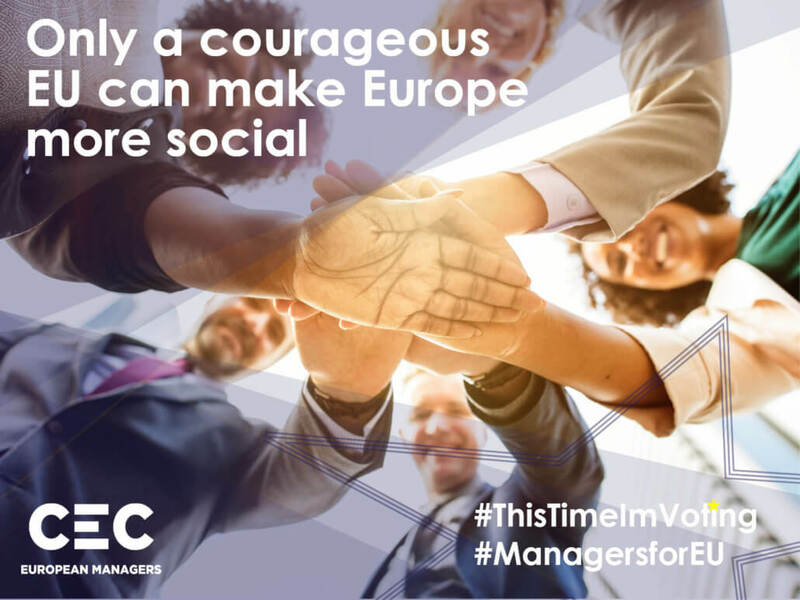 A modern European Parliament resolution on the definition of managers , acknowledging their role in social dialogue and society, shall therefore be adopted. Despite the differences in the contractual provisions that regulate their status and their working conditions, managers share professional features (merit, competence, high level of skills and efficiency) that make them belong to a community. The resolution, based on a set of shared values, shall highlight the new challenges facing the managerial profession (including sustainability, digitalisation and lifelong learning) and shall suggest concrete policies to support them. To prepare managers for a world in transition, a more sustainable leadership model, better managerial education and active involvement in social dialogue are needed. Considering the low levels of professional mobility in Europe and to better share knowledge and best (business) practices, we call for the development of Erasmus+ towards a European learning and mobility scheme also targeting high-level professionals and managers. To that end, the budget of Erasmus+ shall be more than doubled compared to the 2019 budget and extended to all ages. The circulation of ideas and people is one of the founding values of the Union, and one of the keys to supporting technological development and innovation. Managers know it well, given their high rates of mobility. For this reason, the EU should continue to promote cross-border coherence of social protection and make the recognition of diplomas and access to labour markets easier. In that respect, and notwithstanding future developments, the new European Labour Authority should primarily become a one-stop-shop (integrating similar EU agencies) for European labour mobility and information on labour rights. Finally, the portability of rights of Europeans that have worked or will work on UK soil is at risk through Brexit. The same holds true for UK citizens living and working in the European Union. Ensuring clear rules and the best possible outcome for professional mobility should be a priority for both negotiation sides and also in the prospect of defining the rules of the new relationship between the EU and the UK. 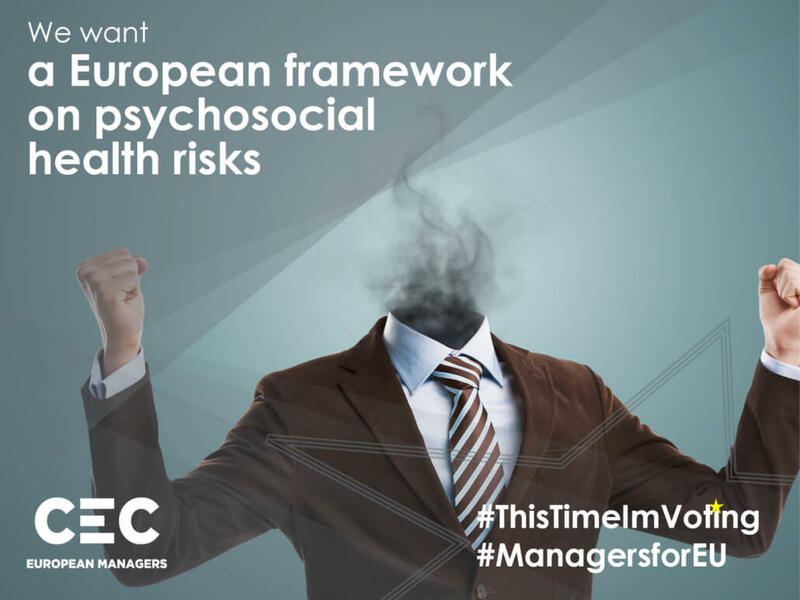 With increasing levels of burnout and stress, action shall be taken to raise awareness about the psychosocial risks linked to work-organization, the impact they can have on the lives of managers and their overall costs. Social partners should take an active role in the implementation of dedicated programmes, with the EU-OSHA agency, linked to raising awareness on the risks and preventing them. Even though a minority of workers and managers effectively deliver digital labour, EU institutions and European social partners should anticipate such a shift also for social dialogue. Social dialogue has proven to bring the economic and social dimension together, smoothening industrial transitions for businesses and workers. Therefore, possibilities to establish mechanisms for improving the reach of social dialogue to new categories of workers and new sectors of activity could be considered. Such new tools should in no case replace existing ones, nor reduce their current material and personal scope or the level of protection they ensure. To create a global level-playing field, the European Union should set legal standards when it comes to due diligence in AI design, liability rules, autonomous driving and other related legal areas. Humans should remain in command when it comes to decision-making. Considering the often-complex issues at hand, new ways of (human) advice and (AI) prediction mechanisms in decision-making processes should be evaluated. In this respect, we would request the European Commission to include AI-related indicators when performing its regulatory analysis on the existing pieces of EU legislation, in the context of the periodical “fitness-check” activities it carries out. Taking a proactive approach to shape digital working conditions of the future will be crucial to avoid accentuating the current trends of increased stress and psychosocial risks, including loneliness. Emotionally skilled managers will become increasingly important to keep the human aspect of work alive. Therefore, EU programmes should provide a funding line for new forms of organisational development that are innovative, digital and providing decent and human working conditions at the same time. The EU should promote promote access, quality and integration of lifelong learning opportunities – both in formal and non-formal education. 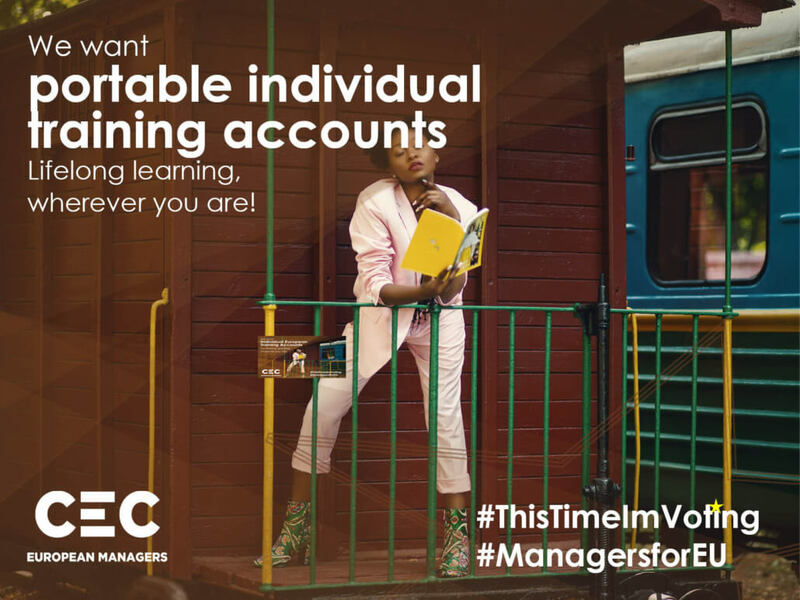 To develop the access to lifelong learning services, and accounting to highly mobile professionals, we call for portable individual training accounts accessible to all managers across the EU. In addition, to ensure a holistic approach to education that focuses on the human factor and includes transversal skills, CEC calls for investigating possibilities to mainstream sustainable leadership into executive education curricula at all levels. The diversity of the innovation landscape in Europe leaves room for creating new synergies both among member states and across scientific disciplines. To steer towards a thriving European R&D ecosystem, we call for doubling the Horizon budget. Particular emphasis shall be put on multidisciplinary research, especially in the domain of AI, with an eye to its potential for multiple industrial applications. With a mix of different measures and policy options, the EU should contribute to increasing the share of women in leadership positions. In this context, the proposal of a directive on gender balance in publicly listed companies launched by the European Commission in 2012 has never made it through the legislative process. We support the necessity that social partners discuss the issue again, we call on the European Commission to create funding lines in EU programmes to raise awareness on the importance of mixed and gender-sensitive leadership. Considering the fact that only one-third of EU citizens are fully aware that they are legally protected against discrimination, the EU should strengthen its efforts to raise awareness on anti-discrimination, but also on diversity and inclusion management through EU programmes. Managers are key drivers of diversity management and inclusion practices in workplaces.